This cabin as sweet as its name. It has modern log construction with the ‘little house on the prairie’ loft. The cathedral ceiling lifts the spirits as you relax by the fire or cool from the summer heat in the air conditioned cabin. The furnishings are ‘lodge-like’ which creates a rustic yet modern ambience. You can “rock the evening away,” in the front porch rockers or relax in the porch swing. This cabin has it’s own unique feature. Ole timey houses often had a “lean-to” or added room attached for a kitchen. We didn’t need another kitchen, so we slipped a hot tub into the added room. Only the guests in this cabin may enter thru the private entrance from your porch! 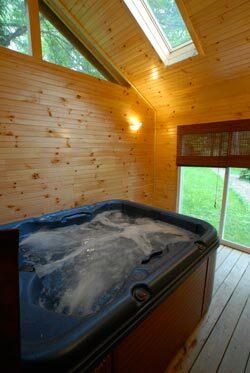 After a dip in the hot tub, you can have a cook out on the deck that overlooks the lovely, grassy lawn shaded with trees.